Not Kayak Fishing, Not Fly Fishing, But Certainly Fun Fishing! I received an invite this weekend to fish with a good friend of mine down in Fourchon. It was an opportunity I couldn’t pass up as I would be fishing with my son, two friends and my son. We planned on targeting red snapper and mangrove snapper but we had to stay within ten miles of the coast if we were going to keep any red snapper. Saturday’s trip turned out to be a great day. 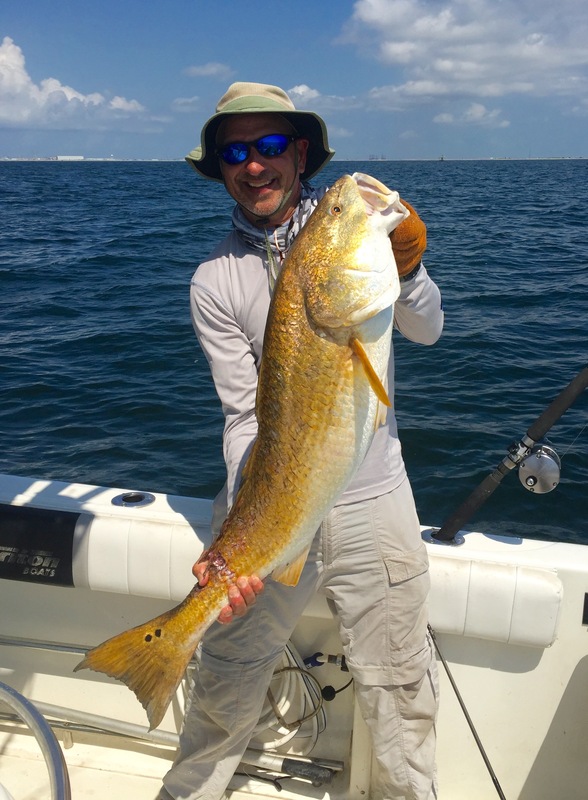 The weather was good early on and we managed to put 20 mangrove snapper, a couple redfish (red drum) a large sheepshead, and a black drum in the box before the weather and wind forced us back in. We didn’t land any keeper sized red snapper but one of the highlights of the morning was when one of the guys hooked into an unidentified fish, a UFO if you will, that doubled over his big rod and ended up breaking off. We never did see it but we guessed that it was either a bull red or a large jack crevalle. The weather looked more promising than Saturday so we decided to begin a little further west than the day before. We tried a few new rigs and Dustin (my son) and Scott (captain) caught several triggerfish and one nice mangrove at our first stop. Since we couldn’t keep the trigger fish, we decided to hit another rig nearby. Well as is typical in our gulf during the summer, you have to watch out for storms and we noticed that a nice little storm was brewing to our southwest and was slowly moving toward us. We picked up and and motored 6 miles to our east to hopefully avoid the storm. When trying to select a rig to fish, I suggested we try a small platform, thinking that the larger ones had been fished heavily since June. There are literally hundreds of small platforms and rigs to choose from in the gulf. We chose one such platform and I hooked us up to the rig. We all baited up with live shrimp on medium to medium-light rods because we were going to be targeting mangrove snapper. 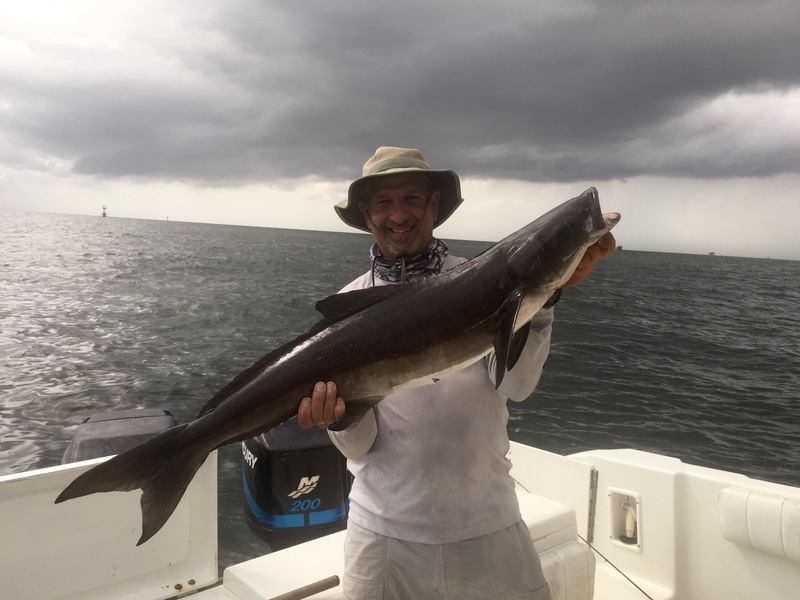 No sooner than Scott had gotten to the bow of the boat with his rod he yells, “COBIA!” Cobia, ling, or lemon fish, as it is commonly called around here, is a sought after species. They are large strong fish that will challenge any angler and the meat is very tasty. When we fish, we bring several rods with us to handle everything from big amberjack and cobia to small snapper. When School yelled cobia, I brought his stout rod to the front and switched rods with him. That was significant because instead of putting Scott’s medium-light rod down, I inadvertently put mine down and fished with his. That turned out to be significant because Scott’s rod (gold Shimano Calcutta reel) was loaded with 50 pound braid and 30 pound mono leader. Mine (also a gold Shimano Calcutta reel) was only loaded with 14 pound mono. While Dustin and Scott tried to locate the big cobia, I decided to fish on the other side of the boat. On my first cast, I hooked a small hardtail. As I was reeling it in, I saw what looked like a shark attack my fish. It got off and I sighed a big sigh of relief thinking that I had just adverted a problem, fighting a four foot shark while Dustin and Scott were trying to lure a large cobia into eating what they had to offer. I thought for a second, I should actually catch a hardtail and they could use it as bait for the cobia. Yeah! Great idea! So I put on another small live shrimp and cast to the pilings of the rig. Before the shrimp could get to the bottom I felt a tap and I started reeling in so the #3 circle hook could do its job. Only…this hardtail was much bigger…it had shoulders…really big strong shoulders. Then Dustin yells, “there he is!” Scott tosses his large jig toward the fish and that’s when I realize…it’s on MY line! Immediately I thought that there was no way I was going to land this thing on my 14-pound test, but I looked down to see that that was green braided line that the fish was peeling off my reel. Wow! I had a chance! Then I thought to myself. “How am I going to land this thing on a medium-light rod?” I was able to put the breaks on the fish a couple of times and was able to turn the fish away from the barnacle crusted legs of the old rust oil platform. After a surprisingly short battle of 5 – 7 minutes or so, Scott had put the gaff in it and was hoisting it over the stern of the boat. It was hard to believe that with all the other large rods on the boat, I had landed a 20 pound cobia on a very small shrimp. A little later, I hooked into another big fish and thought it might be a companion, but it got off and I never saw it. Things slowed down at that rig so we moved on over to another nearby rig. Dustin spotted another big cobia swimming by the legs of the platform and right away we all started casting around the fish. Dustin actually hooked it and fought it for a while but sadly, it broke his leader 😦 We weren’t done for the day because Scott hooked a monster jack crevalle and then both of us hooked and landed bull reds. You can see from the second picture that the storm died out before it got to us and the sun came out. Anyway, it was great to spend some quality time with my son and a couple of friends of mine before I start school. Yes, I start with my camps in the morning. One a side note. I’m going to have to save up to get a 12-weight. I bet that would be a thrill catching one of those on a fly rod!